Drive to the Cape St Francis Resort (click for map) to arrive no later than 11h00. Your vehicle will stay here for the duration of the hike. 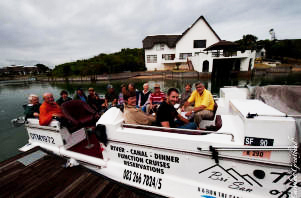 We will take you to Oyster Bay, a trip of around 45 minutes to check in to the Oyster Bay Beach Lodge, your accommodation for the first night. Lunch packs will be provided and you can set off on your warm-up walk. 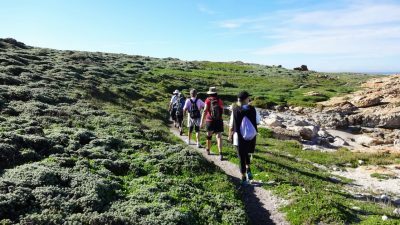 The full walk is around 18km but you can do as much or as little as you like, because it is an out-and-back trail along the coast to Thysbaai (if you have time and you can’t resist adding a beach walk, please note that the bay is 3km long). We suggest you walk out for no more than two and a half hours before turning back. The trail follows the rugged coast line, through fynbos and low coastal thicket. It is peaceful and uninhabited, with only an occasional fisherman to be seen and the crashing waves and birdsong to be heard. At low tide you can see ancient fish traps in a rock gulley, built over two thousand years ago by the KhoiSan. This walk will soothe your spirit and ease your body into the trail mode – and add extra enjoyment to the sundowners and dinner being prepared for you. Should you be lucky to arrive early (or have spend an additional night in Oyster Bay), you can also enjoy a walk on the 8km Oyster Bay beach to Klippenpunt and back. After a hearty breakfast, you pick up your lunch pack, fill enough water bottles to last you at least 6 hours and set off down the road, leaving your luggage to be transported to your next overnight stop. 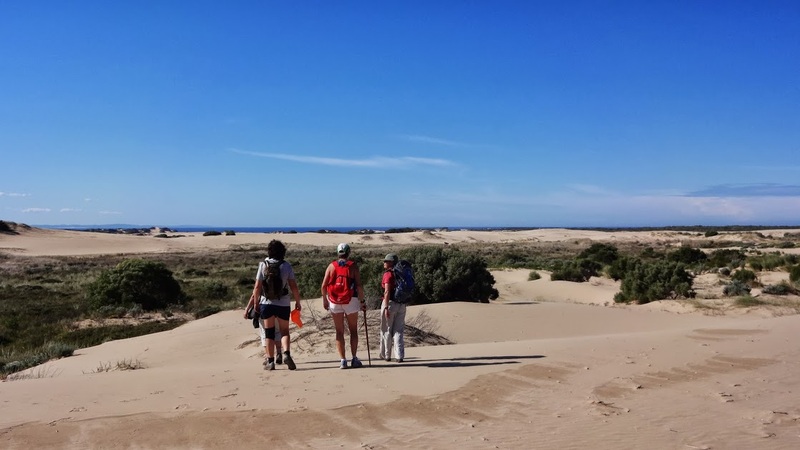 One of the locals will hike with you, mainly because it is impossible to mark the route, and the dunes are forever changing so a route description is also useless (we love the dunes so welcome any excuse to spend a day there!). You leave the road after about half a kilometre, turning through a security gate onto private property and entering another world. Peace and tranquility take over as you walk through the bush, enjoying the birdsong in the coastal thicket on either side of you. The track leads you to the dunes of the Oyster Bay Dune Bypass System, also referred to as the Sand River by the locals. The day’s hiking finishes at the Dune Ridge Country House, situated on a private nature reserve. You will enjoy a well deserved drink around the swimming pool, before you find your room for the night. The day’s hiking starts with a trail through an indigenous coastal forest, where old man’s beard and mushrooms’s worst enemy is bush pigs and small buck. After a few steep dunes (sorry!) you will cross into coastal thicket before you reach the Mostertshoek road. The trail meanders through a small group of holiday cottages at Mostertshoek and along the Wild Side, so named for the untamed sea that crashes onto the rocks in spectacular fashion the length of the trail. Look for otters in the rock pools and keep your eyes open for Oystercatchers, Kelp Gulls, Terns, and Turnstones. 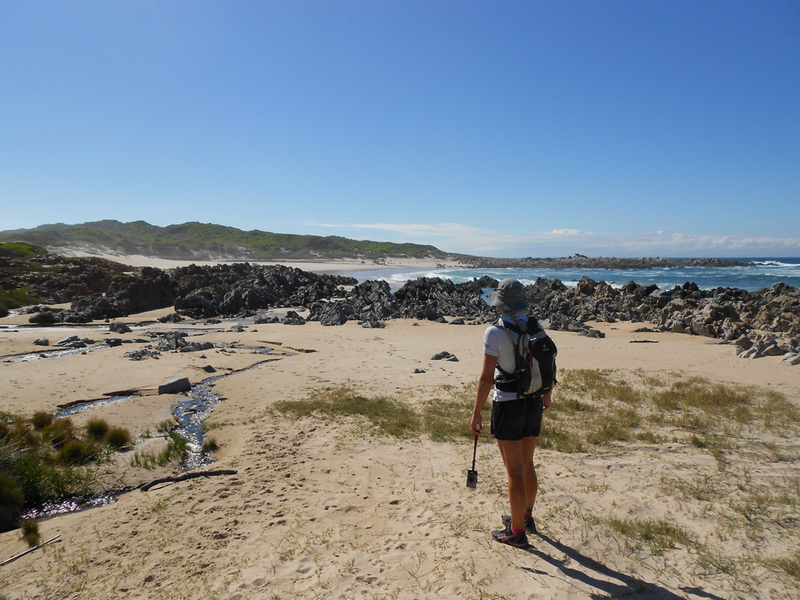 Again you will be accompanied by a local hiker to make sure you don’t miss the second largest blow hole in Southern Africa, the remains of the Osprey (a shipwreck), an unmarked grave and more middens. After about 12km you will arrive at the village of Cape St Francis, passing Sunset Rock on your right. Sunset Rock is a favourite whale watching lookout point as well as a photographer’s dream for sunset seascapes. As you near the lighthouse you will see a giant penguin: this marks the SANCCOB African Penguin Rehabilitation Centre where the team is doing invaluable work to assist injured, sick or oiled birds – they will be expecting you for a visit. From the lighthouse the trail heads for the beautiful sweep of sandy beach of Cape St Francis where a blue drum marks the Cape St Francis Resort – your overnight stop. Procees through the Resort to reception and they will take you to your room. Supper and breakfast is in the Joe Fish Restaurant – enjoy! You will continue your hike on the Cape St Francis beach towards Shark Point, where you often see tracks of the Cape Clawless Otter early in the morning. Around the point you will see Port St Francis, the working harbour for the chokka fleet, hake and pilchard vessels as well as for sea-going yachts and leisure craft of all shapes and sizes. The local NSRI is also based here, doing sterling work off this very unpredictable coast. You will enjoy a tasting of calamari, hear more about the Chokka industry and see a chokka cleaning demo at the Balobi Seafood Market. The hike continues on the Two Harbours Walk towards Granny’s Pool, where you cross to the St Francis main beach. If it is low tide, you will stay on the beach, or find your way through the sea front homes towards the spit that protects the St Francis canals from the ocean. Here a barge will wait to take you on a canal cruise, before they drop you off at Quaysyde for your farewell lunch. It is advised to add a fourth night’s accommodation at Brisan B&B, just around the corner from Quaysyde. You will be transported there and arrangements will be made to bring your vehicles from the Resort.